ICA (Independent Computing Architecture) - ICA is a proprietary protocol for an application server system, designed by Citrix Systems. Products conforming to ICA are Citrix's WinFrame, Citrix XenApp (formerly called MetaFrame/Presentation Server), and Citrix XenDesktop products. These permit ordinary Windows applications to be run on a Windows server, and for any supported client to gain access to those applications. Besides Windows, ICA is also supported on a number of Unix server platforms and can be used to deliver access to applications running on these platforms. There is a wide range of clients supported including Windows, Mac, Unix, Linux, and various Smartphones. ICMP (Internet Control Message Protocol) - A part of the TCP/IP suite of protocols that handles error and control messages between hosts. It is the protocol used by the PING and TRACEROUTE commands. 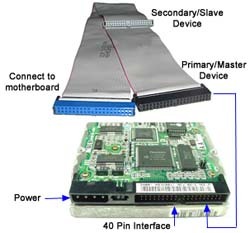 IDE (Integrated Drive Electronics) - Like SCSI, this interface is used for connecting hard drives, CD-ROMs, and other devices to the motherboard. The name of the standard was originally conceived as "PC/AT Attachment" as its primary feature was a direct connection to the 16-bit ISA bus then known as "AT bus"; the name was shortened to inconclusive "AT Attachment" or ATA to avoid possible trademark issues. IDE, a version of the ATA standard was created by Western Digital in the late '80s. Later Western Digital created EIDE (Enhanced IDE) which provided support for hard drives larger than 528mb (up to 8.4gb). The ATA standard has continued to evolve with the release of Serial ATA (SATA) in 2003. IDS - An Intrusion Detection System is a device (or application) that monitors network and/or system activities for malicious activities or policy violations. IDS is a passive system that gives alerts when something suspicious is detected and logs the events into a database for reporting. IGMP – Internet Group Management Protocol is used to manage Internet Protocol multicast groups. IP hosts and adjacent multicast routers use IGMP to establish multicast group memberships. IGMP is only needed for IPv4 networks, as multicast is handled differently in IPv6 networks. IIS (Internet Information Server) - IIS is Microsoft's web server for their Windows platform that also supports writing Web-based applications that access a database. IIS also includes services for FTP, SMTP, NNTP and HTTP/HTTPS. Image Map - An image map is a single image that is broken down into sections that can have a unique URL and other properties associated with it. For example, an image map could be an image of the United States with each state linking the user to a different web page when clicked on. IKE (Internet Key Exchange) - Internet Key Exchange (IKE or IKEv2) is the protocol used to set up a security association (SA) in the IPsec protocol suite. IKE builds upon the Oakley protocol and ISAKMP. IKE uses X.509 certificates for authentication which are either pre-shared or distributed using DNS (preferably with DNSSEC), and a Diffie–Hellman key exchange to set up a shared session secret from which cryptographic keys are derived. In addition, a security policy for every peer which will connect must be manually maintained. IMAP (Internet Message Access Protocol) - Like POP3, IMAP is a protocol used to access email on an email server. IMAP has some advantages over POP3 including the fact that email can be accessed and manipulated on the remote email server without having to download it. Infrared (IrDA) - Infrared is a typically short-range line of sight networking technology which means that there cannot be obstructions between 2 devices that are trying to communicate. It is often used for file sharing between portable devices and can communicate at speeds up to 16Mbps. In certain situations, high power infrared beams transfer high-speed data from 45Mbps to 10Gbps and are installed between buildings within a few miles of each other. Input/Output Addresses - I/O addresses are resources used by virtually every device in a computer and represent locations in memory that are designated for use by various devices to exchange information between themselves and the rest of the PC. Intranet - An intranet is a private internal network in an enterprise. An intranet may behave similarly to the internet with web pages, FTP servers, instant messaging and other forms of communication. The difference is that these services are only made available to members of the enterprise and not the public at large. IOS (Internetworking Operating System) - Cisco's IOS is the operating system used on Cisco Systems routers and some network switches (those which don't use CatOS). It is a multi-tasking operating system and provides kernel services such as process scheduling as well as the command line interface and routing software. IPS - An Intrusion Prevention System performs the role of an IDS, however, it sits inline with traffic flows on a network, actively shutting down attempted attacks as they’re sent over the wire. It can stop the attack by terminating the network connection or user session originating the attack, by blocking access to the target from the user account, IP address, or other attribute associated with that attacker, or by blocking all access to the targeted host, service, or application. Vendors are increasingly combining the two technologies into a single box, now referred to as IDPS. IPSec (Internet Protocol Security) - A framework of open standards for ensuring secure private communications over the Internet. Based on standards developed by the Internet Engineering Task Force (IETF), IPSec ensures confidentiality, integrity, and authenticity of data communications across a public network. IPSEC is made of two different protocols: AH and ESP. AH (Authentication header) is responsible for authenticity and integrity, while ESP (Encapsulating Security payload) encrypts the payload. IPSec operates at layer 3 (network layer) of the OSI Model. Windows 2000 and newer operating systems provide support for IPSec. IPv6 (Internet Protocol Version 6) - IPv6 is also known as "IP Next Generation"(IPng) and has been in development since the early '90's. The Internet Protocol has been around for almost 30 years and with the growth of the internet, this has led to a rapidly declining number of available addresses. IPv4 only supports an address space of 4,294,967,296 while IPng supports addresses which are four times the number of bits as IPv4 addresses and provides for a theoretical limit of 340,282,366,920,938,463,463,374,607,431,768,211,456 addresses! IPv6 addresses are hexidecimal and take the form of xxxx.xxxx.xxxx.xxxx.xxxx.xxxx.xxxx.xxxx. IPX (Internetwork Packet Exchange) - IPX is a networking protocol created by Novell that is used for communication on Novell Netware based networks. IPX is a network layer datagram protocol used for connectionless communications. Higher-level protocols, such as SPX and NCP, are used for additional error recovery services. The successor to IPX is the NetWare Link Services Protocol (NLSP). IRC (Internet Relay Chat) - Acronym for 'Internet relay chat.' An Internet-based communications system that permits people from across the world to hold real-time conversations online in a text-only format. IRC areas are divided into named 'channels,' and any user can open his or her own channel. It is mainly designed for group communication, but also allows one-to-one and private communications. IRQ - Stands for Interrupt ReQuest. This is how a peripheral tells the CPU it needs its attention. There are specific numbers to tell the CPU which peripheral needs time and the priority. The priority is determined from least to greatest (i.e. 0 is the most important and 15 is the least). Most systems have 16 of these IRQs. Some older systems only have 9. This used to limit the numbers of things you can put in a system. Now technology has advanced so there is now IRQ sharing, but be mindful when working with ISA cards and older systems as you can run out fast. IS-IS – Intermediate System to Intermediate System is a link state protocol that operates by forwarding network topology information throughout a network of routers. Each router then independently builds a picture of the network's topology based on the data received and the best topological path through the network to the destination. IS-IS is an Interior Gateway Protocol (IGP) typically used on larger networks. ISA - Stands for Industry Standard Architecture and is an older PC bus architecture typically used for expansion devices such as modems and sound cards. The original form of ISA was a simple and slow 8-bit bus used on IBM PCs. Eventually, the ISA connector was stretched to allow 16-bits of data to pass through each clock cycle, bringing its speed to between 8 and 10 MHz. ISA Server (Internet Security & Acceleration Server) - ISA Server is an integrated edge security gateway produced by Microsoft that helps protect IT environments from Internet-based threats while providing users fast and secure remote access to applications and data. ISA Server is the successor to Microsoft's Proxy Server 2.0. 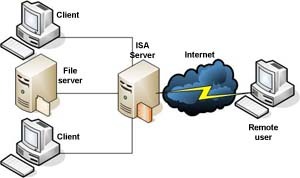 ISA Server provides the two basic services of an enterprise firewall and a Web proxy/cache server. ISA Server's firewall screens all packet-level, circuit-level, and application-level traffic. The Web cache stores and serves all regularly accessed Web content in order to reduce network traffic and provide faster access to frequently-accessed Web pages. More information. ISDN (Integrated Services Digital Network) - ISDN is a type of circuit switched telephone network system designed to allow digital transmission of voice and data over ordinary telephone copper wires. The Basic Rate Interface (BRI) consists of two 64 kbps plus another lower rate channel to handle signalling. Primary Rate Interface (PRI) consists of 23 channels plus a signalling channel. Although DSL technology has caused a decline in ISDN use because of its higher bandwidth and smaller price tag, ISDN is still widely used in the United States for frame relay backup and instances where a circuit switched network is needed.